Development company convener Gavin Clark says he is confident they will be able to build affordable housing on the Hotel Brae – which would be the culmination of 10 years of trying by successive volunteer directors of the CCDC. An appeal has gone out for volunteers to take on an island renewable generation project that could see the community benefit to the tune of £40,000 a year. The Local development officers have started a bid to win funding for a community wind turbine. 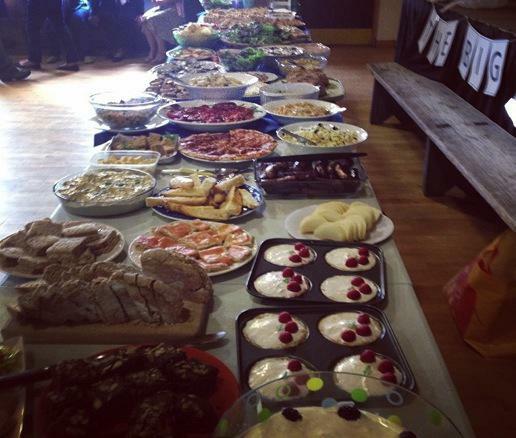 On June 1st Colonsay held its first ‘Big Lunch’ – it is a very simple idea from the Eden Project aimed at getting as many people as possible across the whole of the UK to have lunch with their neighbours annually on the first Sunday in June in a simple act of community, friendship and fun. There was a fantastic turnout, approximately 80 people. The range of food was absolutely amazing, everyone made a real effort. Community Land Scotland, the representative body of Scotland’s community land owners has published economic indicators data of community ownership. The report demonstrates remarkable results showing that community ownership can out-perform the past private ownership of the land in question. Following on the Community Land Scotland report the Corncrake asked the convener of the Gigha Heritage Trust, community owners of the island just to the North of the Kintyre peninsula how they are getting on. Gigha was purchased from the Horlicks Family in 2002 for nearly £4M from public funds and community loans. The CCDC held its Annual General Meeting on Thursday evening….